All the pup parents, we found a few gifts that you can treat your enthu bunnies with. From chew toys to tasty treats this brand does everything with love for the little loves. All the pup parents, we found a few gifts that you can treat your enthu bunnies with. From chew toys to tasty treats this brand does everything with love for the little loves. We love the little squeaky dogs made of leather and twisted colourful knots for the furry tales to play with (or chew onto). The ropes are made of high quality non-toxic environmental cotton which won’t harm your pet even if particles are swallowed while happily chewing their way to happiness. You can even just skip spa visits and instead get yourself a Dog Nail Clippers and Trimmers by PetSutra that will help you trim and file for pooch’s nails at home. If you're worried about your pooch's paws during walk time, then checkout these anti-slippery socks that will help them comfortably walk on hot pavements this summer (no more burns). These socks will also protect your pupper’s paws from nail scratches, dirt and grime. Made of 100% cotton and reinforced with strong eco-friendly glued gripper, these are durable and will last longer with any number of washes. No more wounds, yaay! 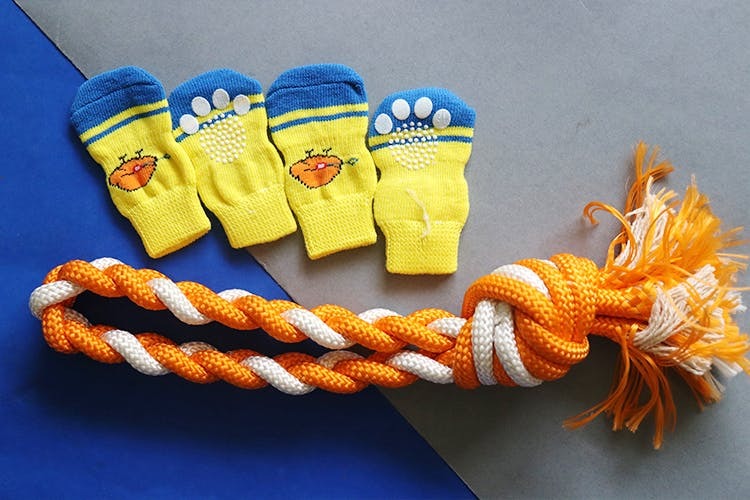 We have a special combo for you which has a set of anti-slip socks and a rope toy. This exclusively priced combo at INR 590 is summer treat that you must order for your pooch and help them run around with their happy wagging tails.